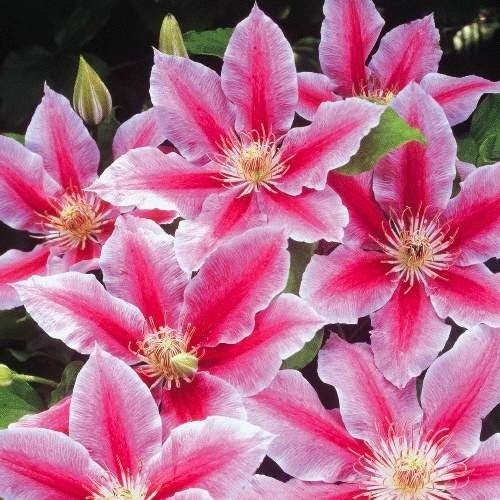 Ornamental plants from the clematis genus are amongst the most popular of all flowering climbers. They thrive best in full sun, with their roots in cool, moist, well-drained soil. As well as flowers they produce attractive, silky seed heads in the autumn. The large flowering hybrids are some of the most colourful of all garden plants, and when positioned with thought will have a charming if not spectacular effect within the garden environment. Perhaps the most popular of all the large flowering hybrids is the free-flowering Clematis 'Nelly Moser', a cultivar from the Lanuginosa group. Clematis lanuginosa is a twice-bearing clematis that blooms once in spring and again in summer. It is best known as a parent species for many of the large-flowered varieties of Clematis. It was first cultivated as garden species in 1897 and received its Award of Garden Merit (AGM) from the Royal Horticultural Society in 1984. Clematis 'Nelly Moser', has one of the largest of all flowers from the clematis genus which when established can reach an impressive 8 inches diameter. Each flower is mauve-pink in colour, and each sepal is intersected with a carmine central bar. It flowers in May and June on the previous seasons wood, with a second (but not quite as impressive) bloom in August and September. 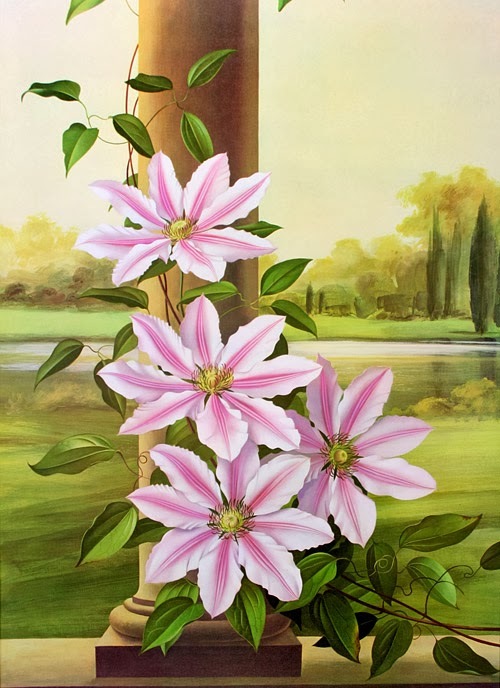 Unlike most other clematis hybrids, Clematis 'Nelly Moser' will do best on a north wall or at least a shady position to prevent the flowers from becoming bleached in strong sunlight. Best practice is to plant the root ball of Clematis 'Nelly Moser' a good 6-8 inches below the soil surface, and there is good reason for this. If you are unfortunate enough to suffer Clematis wilt on your prized specimen, you will find that there is an excellent chance of recovery as the fungus does not appear able to pass through the soil into the root system. When buried like this there is a good chance that the plant will survive the damage of the infection and produce new shoots from the base later on in the growing season. Good drainage is important and the roots will need to be kept cool. If the root area is open to the sun they they will need the protection of a gravel mulch or the shade of a closely planted ornamental plant. 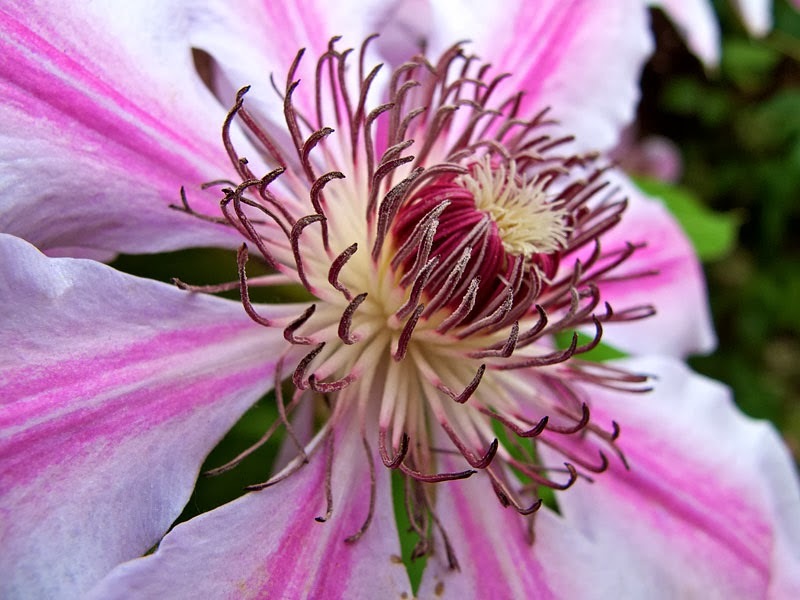 Clematis have a large nutrient requirement and will require an annual mulch of well-rotted farm manure, together with an ample supply of water. After the first flush of flower in the spring the only pruning required is to trim back the old flowering growths. This will need to be done immediately after flowering. Old, densely wooded plants can be hard-pruned in February but be aware that you will lose the spring flowers.